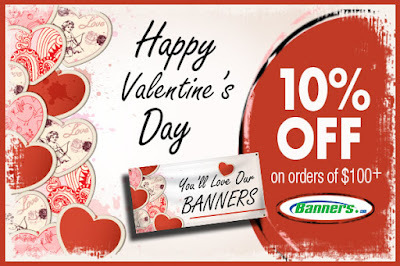 Mention promo code "Valentine16" to get 10% off orders of $100 or more at Banners.com! Hurry, this offer is only valid until February 5, 2016. Limit one time use per customer / company. You can use this promo when you order all of your Valentine's Day signage, or plan ahead for St. Patrick's Day or Easter signage. Visit our website to get started on your order!